Model Name: Oyster Chronograph "Barilotto"
Signed: Case, dial and movement signed, bracelet further signed "GF"
Accessories: Accompanied by Rolex numbered guarantee dated 1951, a copy of Dreams That Money Can Buy by John Bradshaw, a notarized letter by L. Harvey Poe, Jr. stating that the present watch is inscribed "Harvey love Libby Jan. 1951" and that it was given to him by Libby Holman when they were vacationing in Switzerland and Wikipedia article regarding Libby Holman. Preserved in excellent overall condition and offered with its original guarantee, this reference 3525 presents an extremely compelling and interesting story. Most notably, the caseback is signed "Harvey Love Libby Jan 1951". The watch was gifted from the actress Libby Holman, to L. Harvey Poe, Jr. in 1951. A notarized letter from L. Harvey Poe, Jr. states "this was given to me as a gift for my 35th birthday by Libby Holman, the American singer and actress, while I was studying at Oxford and she was living in France...she purchased it while we were vacationing in Switzerland." An actress, model and singer, Libby Holman achieved notoriety for her daring and provocative life, which is presented in the biography Dreams that Money Can Buy by Jon Bradshaw. Chapter 49 of the book is particularly interesting, as it recounts Holman's sojourn in France and directly corresponds with Poe's letter. In 1951, Holman embarked on an affair with an Oxford student and stayed "at the home of one of [his] friends, another Rhodes scholar". Indeed, research reveals that L. Harvey Poe, Jr. was a Rhodes scholar at Oxford. It is most likely that Holman bought this timepiece for the aforementioned gentleman who hosted her in Oxford. The watch itself is a very interesting specimen. 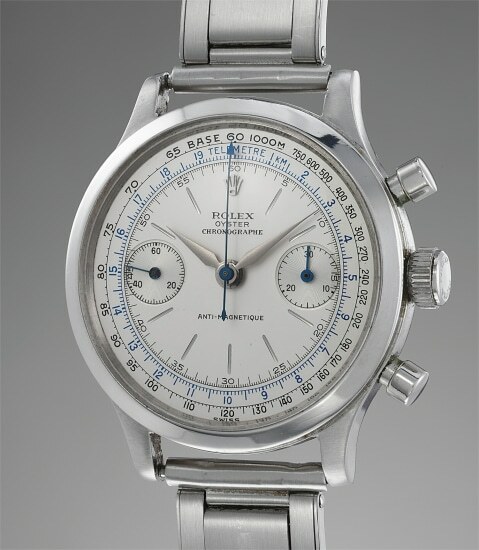 Produced late into reference 3525's production period, it displays "Rolex Oyster Chronographe" in three lines of straight text rather than "Rolex Oyster" in curved text. One can surmise that given the 6 years between the date of manufacture and its sale date, the present watch case was kept as stock for a number of years after the reference ceased production. Rolex then assembled the watch with a dial that was in the style of the beginning of the 1950s before its sale in 1951. Offered with its original numbered guarantee dated 1951 indicating the present watch was sold at W. Rösch in Bern, this watch is preserved in impressive condition, with full proportions. The accompanying letter states that this watch was serviced only once throughout its lifetime, and the condition of this timepiece is testament to Poe's words. The dial is preserved in excellent condition, with hardly any signs of aging. It is even accompanied by a wonderfully preserved Gay Frères bracelet stamped for 1949. Case, dial and movement signed, bracelet further signed "GF"